Last night, President Trump at a rally in Council Bluffs, Iowa, called the Democrats, “an angry left-wing mob,” who are “too dangerous to govern.” We’ve grown used to his blatant fearmongering, but this was different. He’s clearly trying to rile up his base before the elections next month, but as we’ve witnessed time and again his rhetoric is dangerous, giving cover to those in our country who act out of hate. 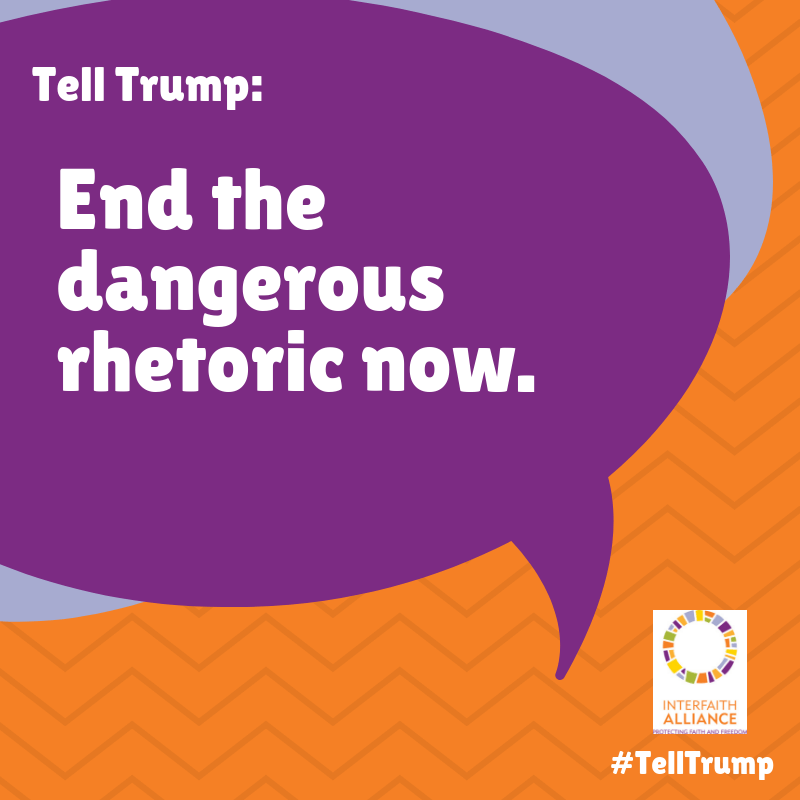 Tell Trump: End the dangerous rhetoric now. Take this past week, for example. Flyers from the white supremacist website The Daily Stormer were found on college campuses in California and New York and across Des Moines, Iowa, including on the window of our local affiliate, Interfaith Alliance of Iowa. The flyers weaponized the claim of the president and Republicans that legitimate opposition to the nomination of Associate Justice Brett Kavanaugh was a “mob” made up of protestors paid by philanthropist George Soros, a not-so-thinly-veiled bit of anti-Semitism. Demand Trump put an end to this rhetoric and to condemn those who use his words to harm others. Trump’s love for spreading hate and fear is emboldening groups across the country to lash out at the most vulnerable groups in our society. This type of hate must not become entrenched or allowed to flourish in this country. Join us in opposing the dangerous rhetoric from the highest levels of our government. After you’ve taken a moment to send a message to Trump, please share this with your friends and ask them to do the same.